Congratulations! Now that You’ve joined CrocoBlock and are an owner of a service subscription, it is time to visit your personal account page. In this documentation block you can find the detailed instructions on how to access CrocoBlock products available for downloading and use your account page. You’ll also learn more about managing your Personal Account on CrocoBlock. 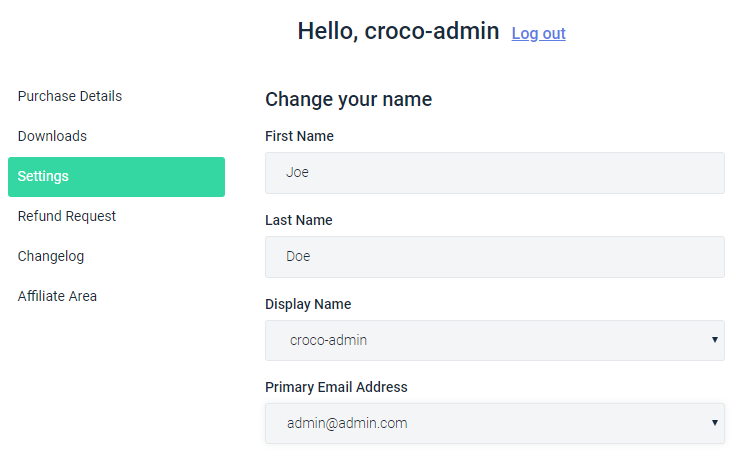 When you logged in to CrocoBlock you need to click on Account option located in the top right corner. We’ll overview each of them below. subscription - click Manage Subscription option to manage your current subscription in the case you want to upgrade it or prolong it. In this block you can find all the products available for using and installing with your CrocoBlock subscription under the terms of your current license. 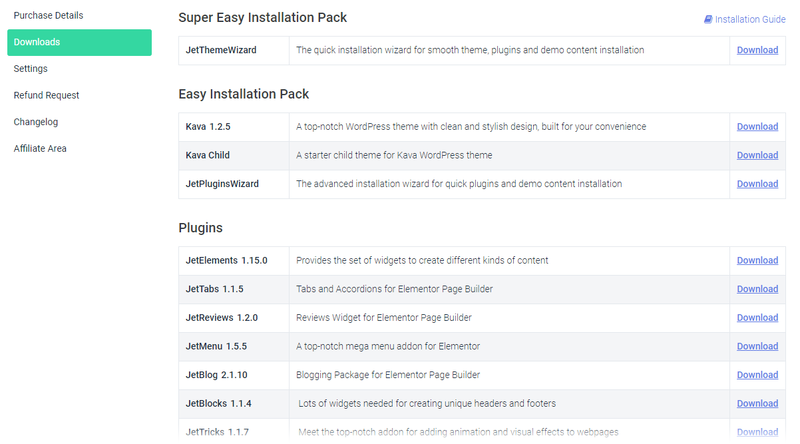 Super Easy Installation Pack - this pack contains JetThemeWizard, the quick installation wizard for smooth Kava theme, Jet plugins and demo content installation. Jet Plugins Wizard - the tool which installs the plugins and demo content automatically. Plugins - the block contains the latest version of plugins which are now available for installation and usage. The list can be updated with time as more plugins roll out. Misc - this block contains the tools, which are needed for perfect compatibility headers/footers from JetThemeCore with Astra, OceanWP and GeneratePress themes; JetEngine functionality in JetElements widgets. Bonus Images - the block contains the high-quality image packages on different topics available for usage. Here you can manage your account information. Fill in the needed info in the corresponding fields in order to provide or change the necessary data: name, billing address and password details. In the case you want to get a refund you can submit it in this block during 30 calendar days from the purchase date. Note, that after the 30 days the Refund Request field will disappear from your account. Here you can view information on the latest updates of the products included in the CrocoBlock subscription.​ You can find out the version and the release date along with the list of updates included. 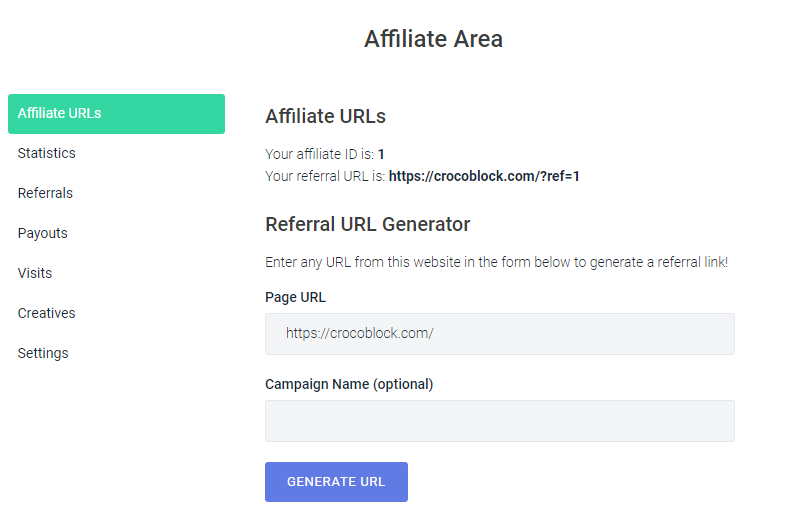 Referral URL Generator - here you need to enter page URL from crocoblock.com website in the form below to generate a referral link. Also you can indicate campaign name optionally. In this block you can find the statistics data about referrals, visits, earnings and conversion and commission rates. Here you can view referrals via your referral link. Here you can view the information about your referral payouts (its date, amount, payout method and status). In this block you can view the list of referral URL visits. Here you find the banners, which you can place on your website to promote CrocoBlock. Here you need to input your payment email. Note: you can use only Paypal email.